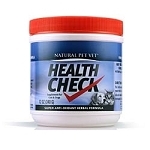 Health Check enhances your pets immune system against bacteria, viruses, pollutants, and free radicals with super potent antioxidants. 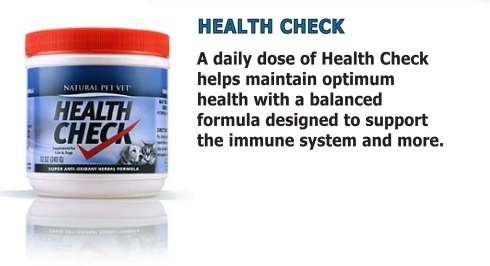 A daily dose of our Health Check will help them maintain optimal health. If they are already sick, it will help them get over "it" by supporting the detoxification of the liver and supporting the immune system. Along with a potent amount of Grape Seed, it contains a special blend of herbs, probiotics, vitamins and amino acids.The Grape Seed alone is 50 times more powerful than Vitamin E and 20 times more powerful than Vitamin C! It only makes sense to help the body in every way possible to get rid of the “junk” that it is exposed to day in and day out. Anti-oxidants do just that! The best analogy I’ve heard is that the foreign substances to which the body is exposed day in and day out cause the body to “rust” – and anti-oxidants prevent the rusting. The beneficial effects of antioxidants are not often seen immediately in a relatively healthy horse or person but are often immediate in allergy horses, especially when really good anti-oxidants are used. No doubt about it – anti-oxidants add years to ones’ life; but when severe allergy cases can be reversed with their use – that impresses me. For instance, my first experience with anti-oxidants in horses overwhelmed me. I had a horse patient with Heaves that was really about ready to die, and because I had seen tremendous beneficial lung changes in people from using grape seed in such cases, I decided to try it. 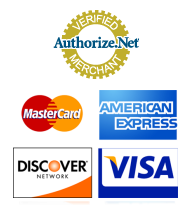 You won’t find a better product anywhere, much less at our price! 1 teaspoon per 25 lbs. daily (divided amounts if given more than once daily). When starting this product or when needed, amount may be doubled to 2 teaspoons per 25 lbs. PRECAUTIONS: SAFE USE IN PREGNANT ANIMALS OR ANIMALS INTENDED FOR BREEDING HAS NOT BEEN PROVEN. NOT INTENDED FOR NURSING PUPPIES OR KITTENS. Ascorbic Acid, Beta Carotene, Deglycyrrhized Licorice Powder, DL-Methionine, Dried Liver Extract (Porcine Source), Garlic Powder, Ginko Biloba, Dried Ground Grape & Seed Pomace*, Grape Seed Extract, L-Lysine, Maltodextrin, Montmorillonite, Pine Bark Extract, Vitamin E Supplement, Whey, Yeast Culture. "ALL of our cats and dogs are supplemented everyday with anti-oxidants. We want them around a long time." 12 ounce size equals 3-month supply for up to a 25 pound pet. 24 ounce size equals 3-month supply for up to a 50 pound dog. 5 pound size equals 10-month supply for up to a 50 pound dog.